Be the first to share your favorite memory, photo or story of Merlene. This memorial page is dedicated for family, friends and future generations to celebrate the life of their loved one. 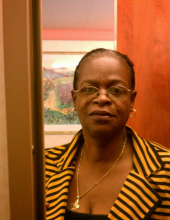 Merlene Gwynneth Williams, 65, of St. Thomas, died Wednesday, December 5, 2018, at Schneider Regional Medical Center. Relatives and friends are respectfully invited to attend the first viewing on Friday, December 21, 2018 from 5-7 p.m. at the Celestial Chapel of Dan Hurley Home for Funerals. The second viewing will be held at the Church of God of Prophesy – C5 Estate Hoffman, on Saturday, December 22, 2018 from 9 to 10 a.m. The service will follow immediately at 10 a.m.
To plant a tree in memory of Merlene Gwynneth Williams, please visit our Tribute Store. "Email Address" would like to share the life celebration of Merlene Gwynneth Williams. Click on the "link" to go to share a favorite memory or leave a condolence message for the family.